"May the eyes of your hearts be enlightened, that you may know what is the hope that belongs to his call, what are the riches of glory in his inheritances among the holy ones and what is the surpassing greatness of his power for us who believe." This Conference promises to bring the joy, peace and love of the Holy Spirit to the very depths of your soul so that your heart and mind are open to receive more of the Spirit in your life. Jesus longs to open the eyes of your heart so that you are inspired by His love, and emboldened by the power of His Holy Spirit to go out and comfort his people, bringing them His hope and His love. Come join us for a day of praise and worship, of fellowship and joy in the Spirit. Take in the wisdom of our conference speakers and allow the Holy Spirit to go deeper into your soul. Let the music uplift you and enable you to surrender to the movement of the Spirit within. Mail-In Deadline Date: must be postmarked by October 15, 2018. 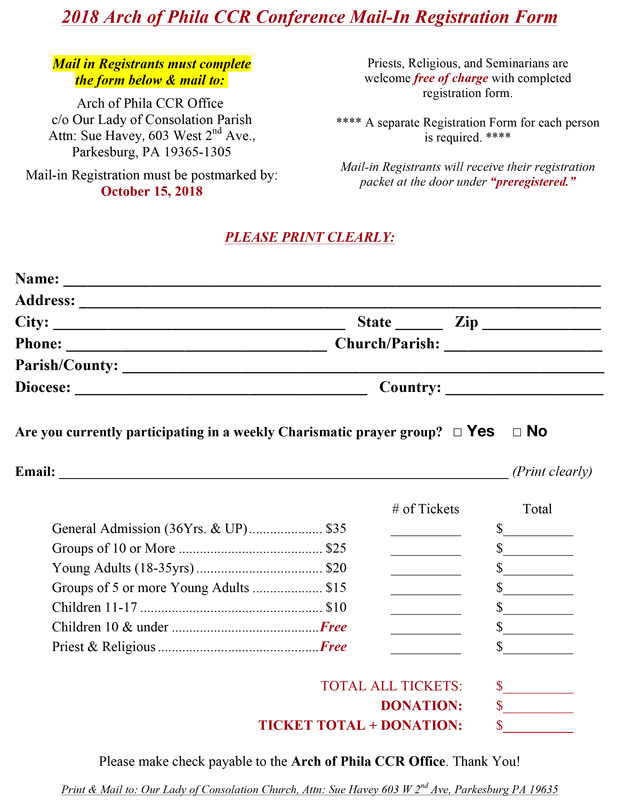 **Registration includes parking, all sessions, prayer & praise, Mass, Confession, Healing Service, Vendors and so much more!